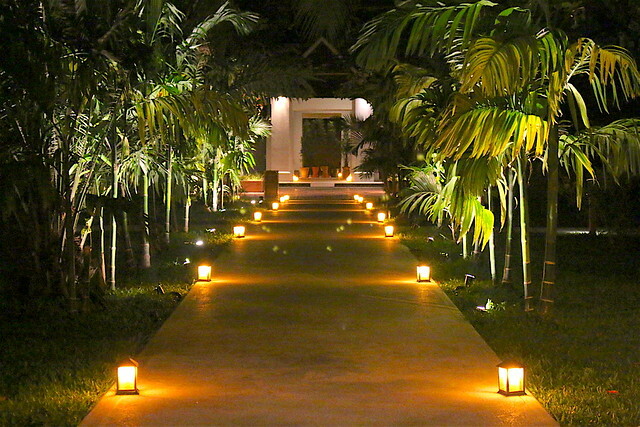 The Sofitel Luang Prabang is one of the most beautiful resorts in Laos. This luxury all-suites hotel is perfect for languid honeymoons, quiet family vacations, or even solitary escapes. 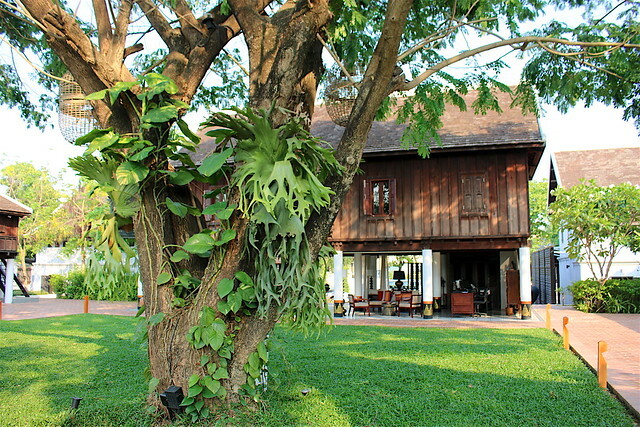 This property was originally built as a French Governor's residence in 1900s, and is protected as a UNESCO World Heritage Site. Each of the 25 suites has a five-meter-high ceiling, private garden and a pool or gazebo with oversized bathtub. 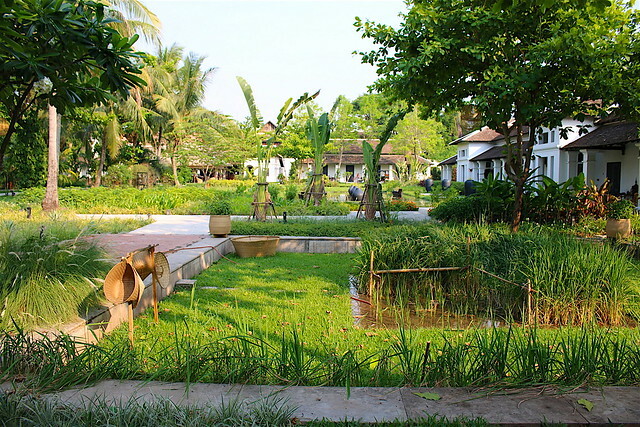 This Sofitel is such a verdant oasis, truly an escape from urban hustle. 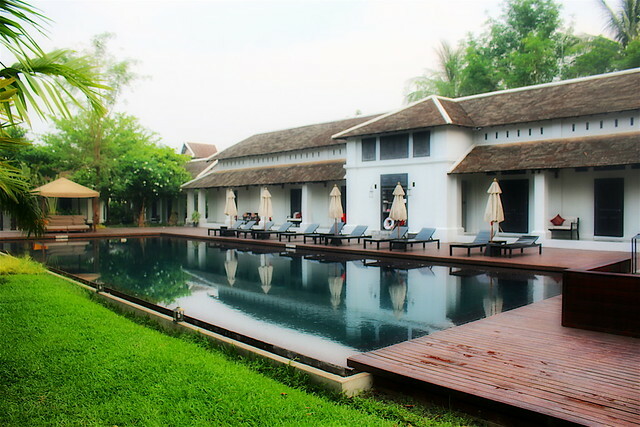 Yet it's only 5km (3 miles) from the Luang Prabang International Airport. The heritage building and lush grounds feel far from the rest of the built-up world and yet have all the five-star amenities you would need. The amethyst-tiled infinity pool is just stunning. There's even a little rice paddy field. Kids can experience for themselves what it's like to plant this staple grain. 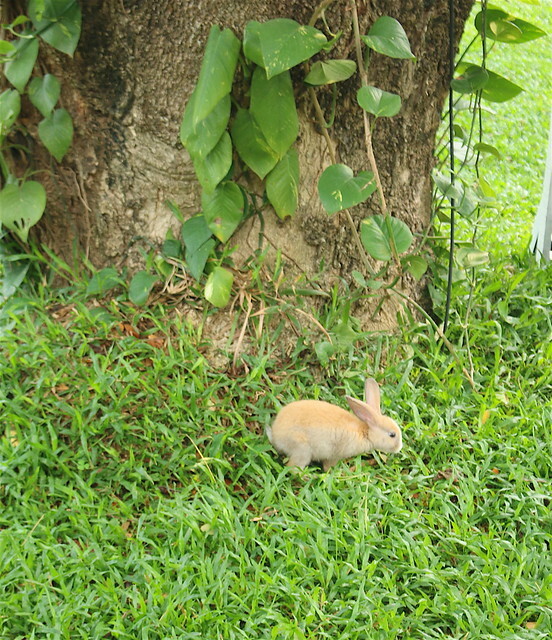 You'll even see wildlife hopping about sometimes. There's so much to see in the botanical gardens, but retreat into the rooms and you might just want to stay there forever. 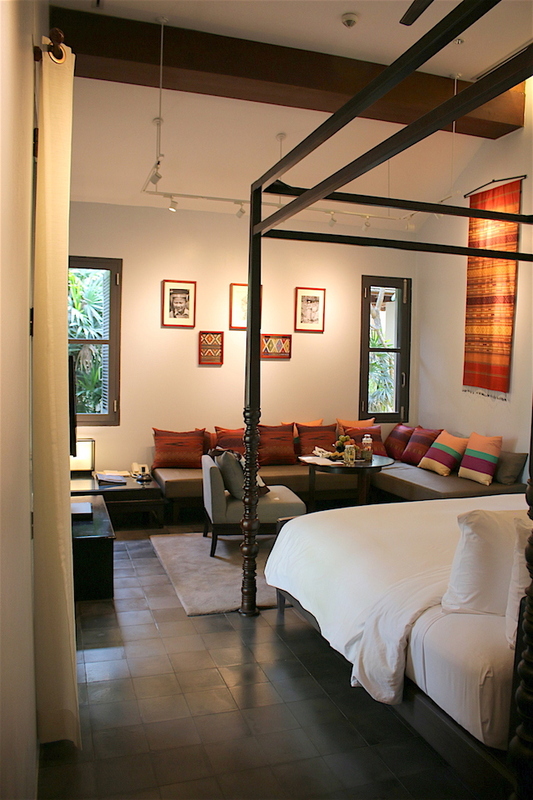 It feels like such a treat settling into a beautiful cosy suite tastefully adorned with Lao silk and artefacts. I was grateful for good air-conditioning in the near 40-degree C heat. 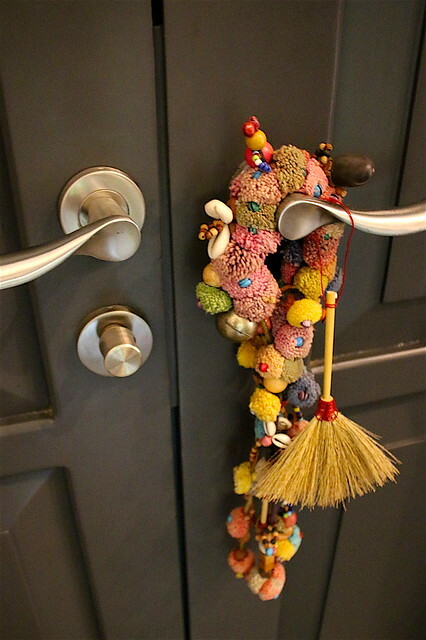 Even the hotel door hanger tag (for cleaning your room) is so whimsical and cute. 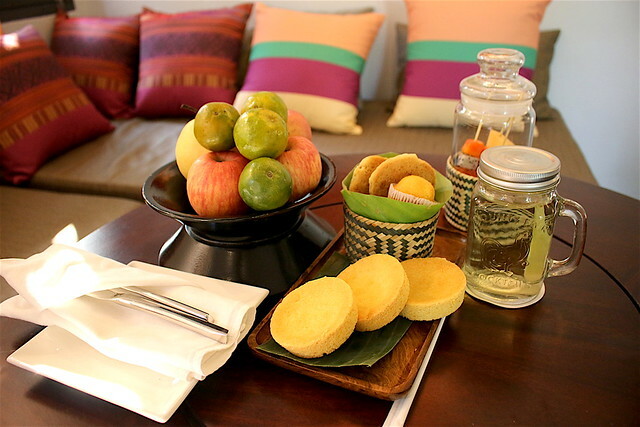 A generous platter of welcome fruit and cookies awaits you in the room. There's also this chilled lemongrass drink with a touch of pandan, completely unsweetened but incredibly refreshing. 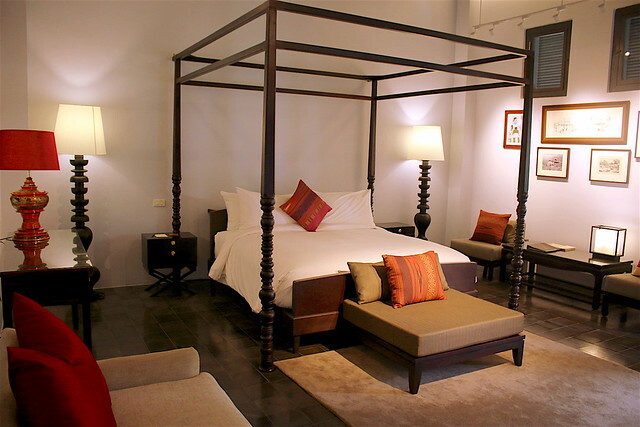 The spacious Superior Garden Suite with a King bed (or two single beds) is 55 m² (592 square feet). 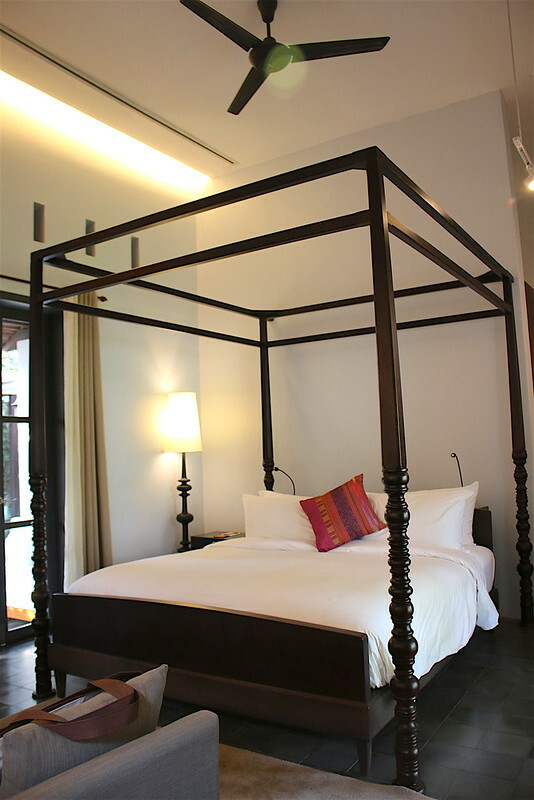 The four poster bed fits easily with the five-metre high ceiling. 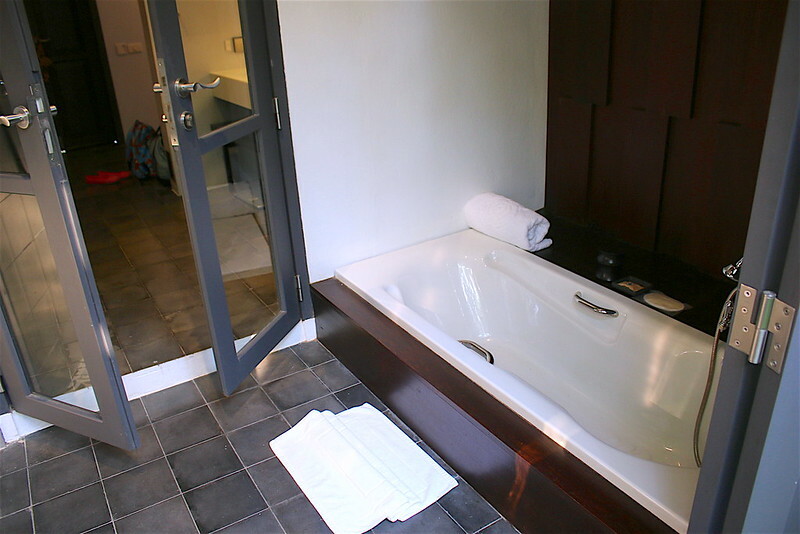 The suite comes with rain shower, indoor sunken bath and dressing area. 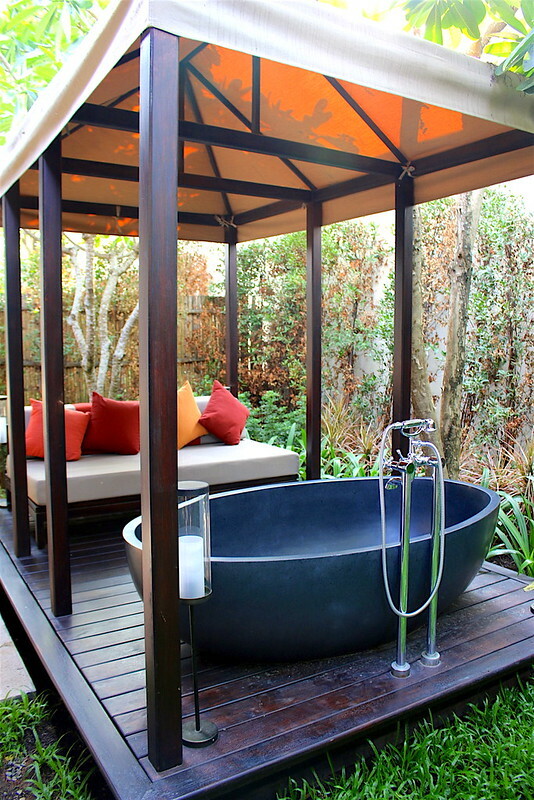 The outdoor bath pavilion is a shrine to indulgence. The oversized stone bath tub is a total spa experience that you must not miss. 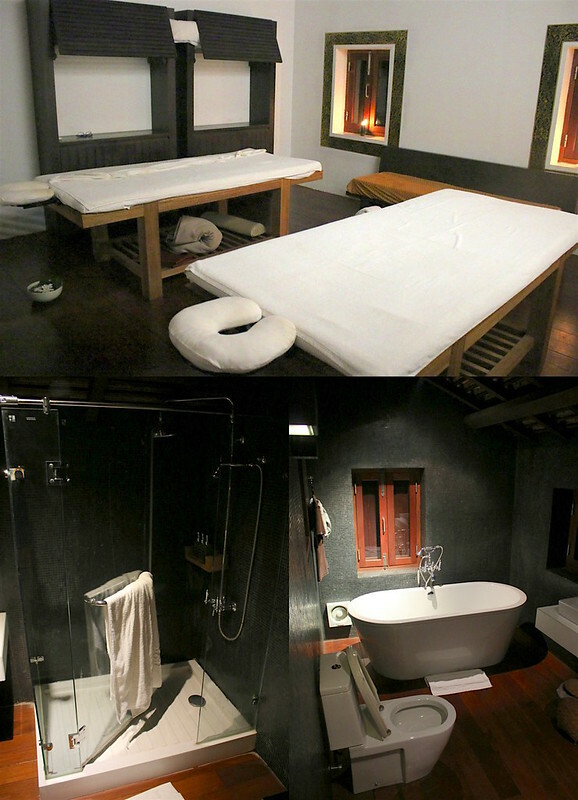 You could enjoy soaking in cool waters in the daytime or have a hot bath in the evening lit by candle-like lights. Or just laze around and read a book. This is one of the things I would so come back for. When I posted this on Instagram, the bathtub maker Trusol Bathware made a comment! They do have such nice tubs! 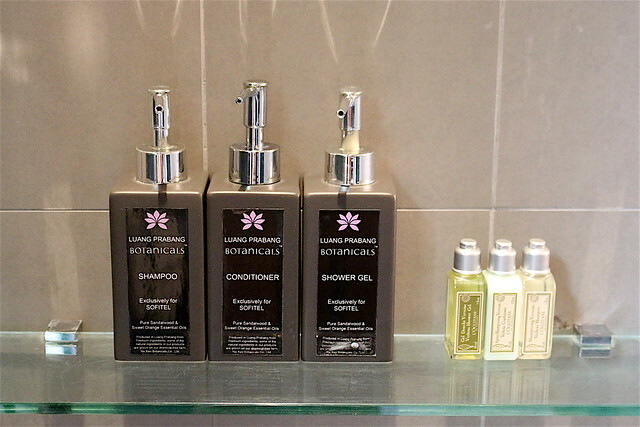 In the shower you will find full-size Luang Prabang Botanicals made exclusively for the Sofitel and travel-size L'Occitane amenities. 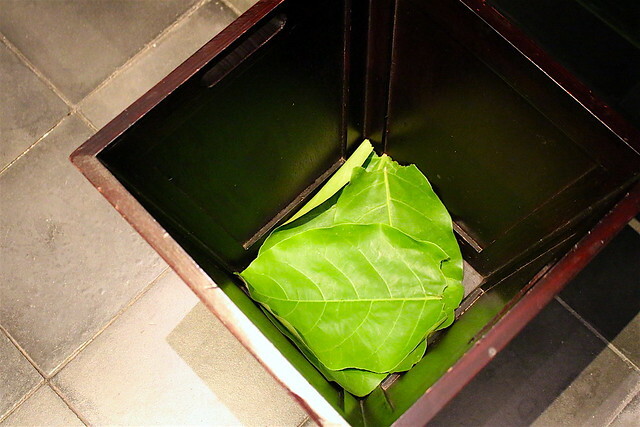 There are small little organic touches like the liners for the bins - the real leaves are not only biodegradeable but look oh-so-pretty. I love the in-room tea and coffee supplies! 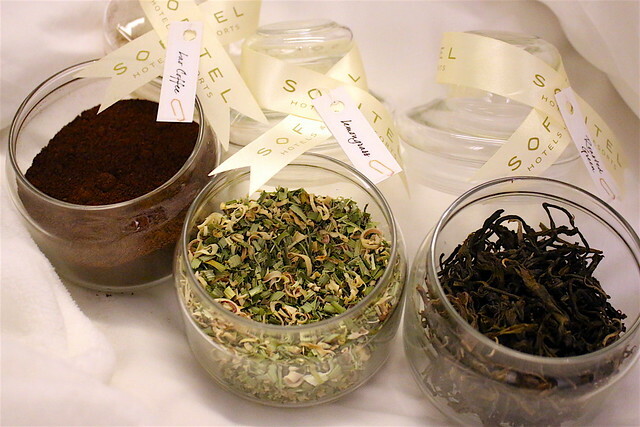 Instead of the usual packaged envelopes, you get pretty jars of Lao coffee, that fabulous lemongrass tea and roasted green tea. They also provide glass bottles for water instead of plastic bottled water. Other suites include the with ultra spacious 70 m² (754 square feet) Heritage Suite, and the Pool Villas which have a small plunge pool. I prefer my Garden Suite with the oversized bath gazebo though. For an all-suite hotel of this quality, I was expecting prices to be pretty high, but rates start from just US$133. 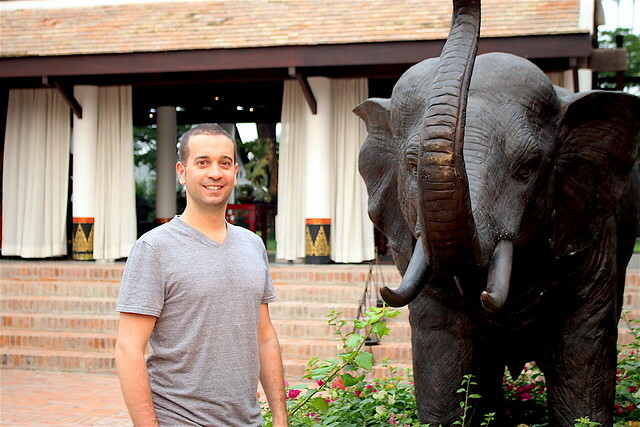 When you are in Laos, you cannot help but be immersed in the spiritual air that envelopes the lives of the people. The Sofitel embraces the rites of the locals - here we see a blessing ceremony by village elders - to allow guests an opportunity not just to be spectators but active recipients of positive energy. 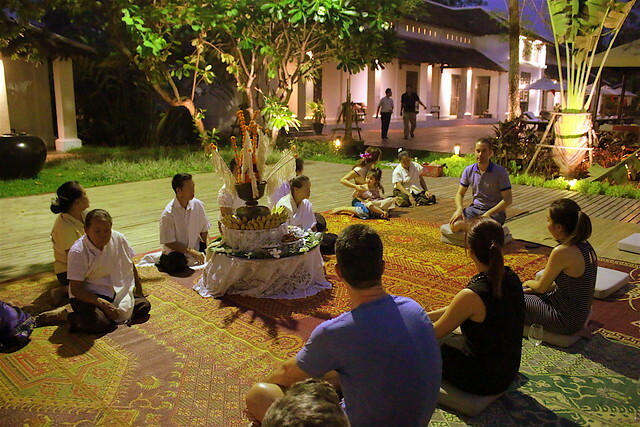 The Lao people are incredibly spiritual, and this is a great place to regain centredness. Each of us were blessed by the elders who tied a bundle of strings on our wrists. I wore these "blessing bracelets" for a full seven days. Most locals will carry them until they wear off naturally. The resort is not a long walk from the town centre (maybe 7 blocks?) - it is totally safe to walk home even at night. The Governor's Grill is the dining hub in the hotel, and the food here is absolutely fabulous. 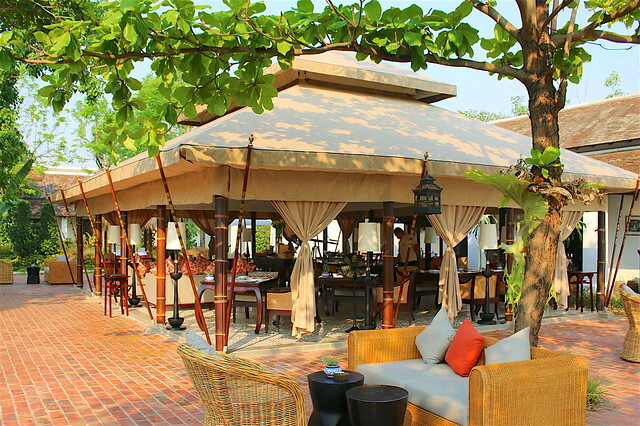 This beautiful tented restaurant is also the only steakhouse in Luang Prabang. The presentation of the food is as good as that in any big city restaurant. And it's not an expatriate chef in the kitchen, but a local chef that the hotel has helped to train. I was very impressed. Our dinner began with salads. 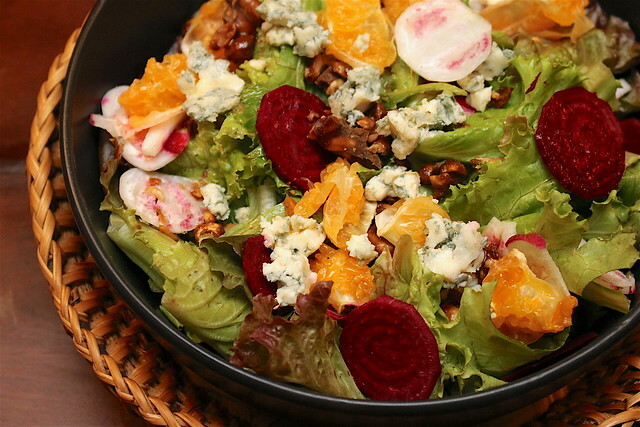 The Blue (above) features seasonal fruit, blue cheese, nuts and lettuce dressed in honey vinaigrette. Local buffalo is a specialty here, and we would see it served five different ways tonight. 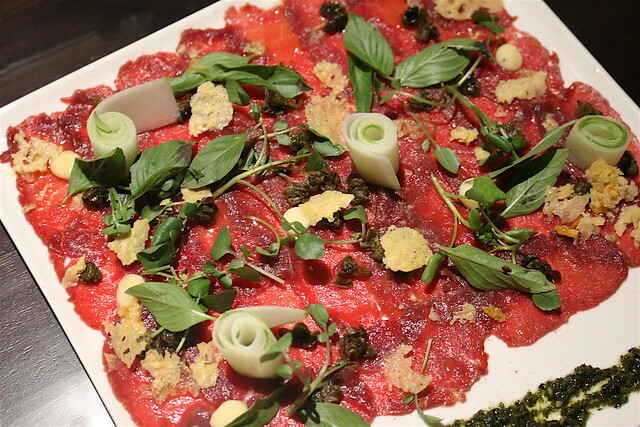 This is the Buffalo Carpaccio with Parmesan, capers, pesto and citrus mayonnaise. Absolutely gorgeous and melt-in-the-mouth. 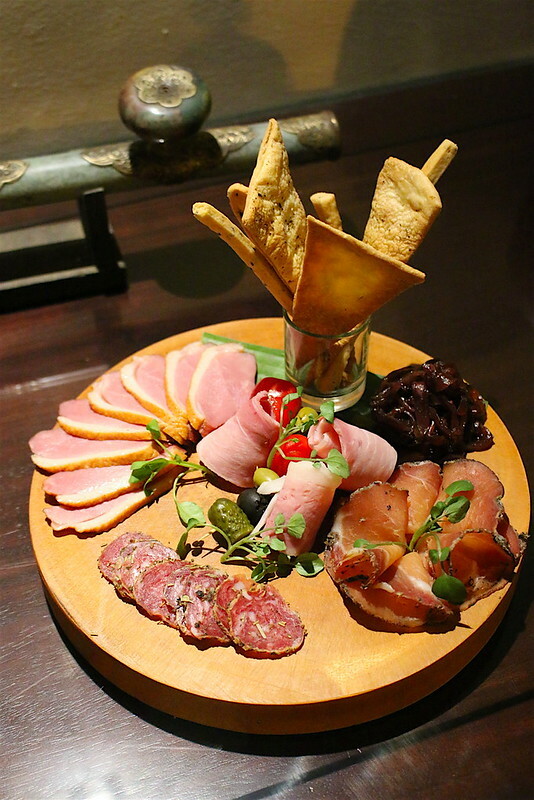 The Charcuterie is a delightful ensemble of Coppa ham, smoked duck breast, Iberico ham, chorizo, pickles and olives. 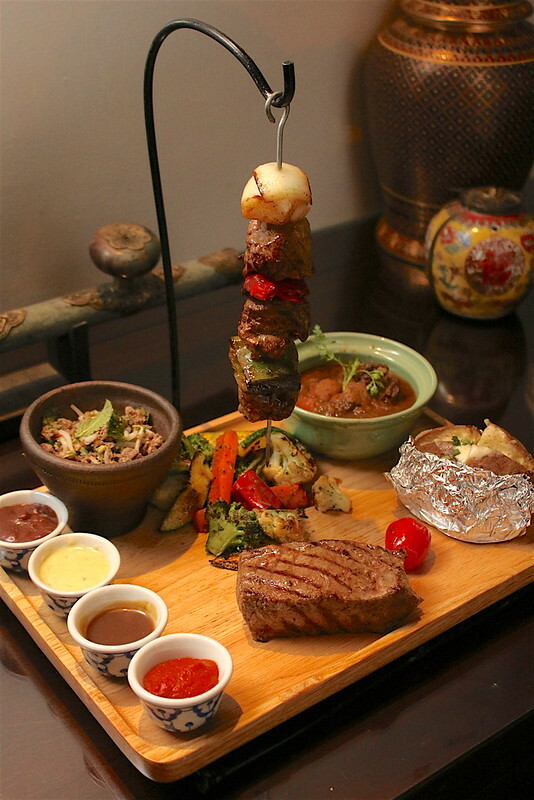 The Buffalo Tasting Platter has the remaining four treatments: Laap, Bourguignon, rib steak, and skewer. I like the first two best. In bigger chunks, the buffalo can be a bit more chewy. The meat is still deeply flavourful with a strong beefy aroma. The platter includes sides like baked potato, stir-fried vegetables, and sauces (barbecue, cheese, tamarind, red wine). 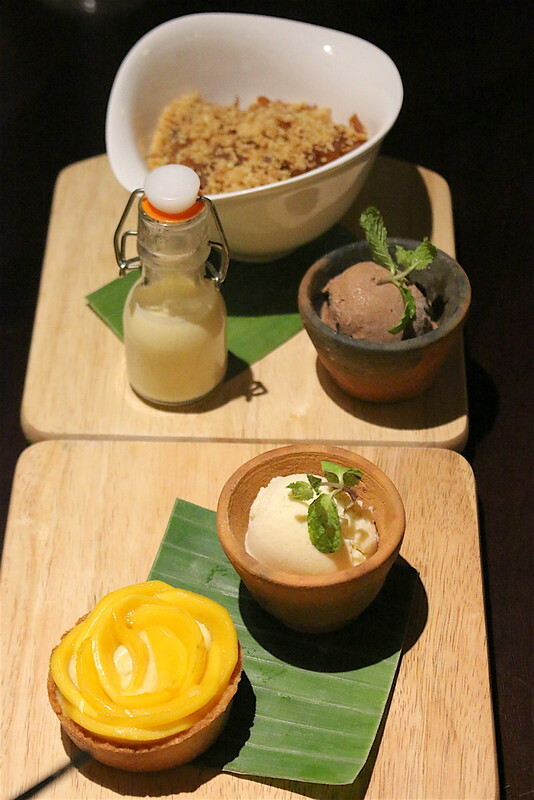 Dessert - a pretty rosette of a Mango Tart (foreground) with frangipani, pastry cream and a scoop of vanilla ice cream; and an Apple Crumble with creme anglaise and chocolate ice cream. The best part is the superb locally-made ice cream. Breakfast is at the Governor's Grill; it's a small but very satisfying spread. 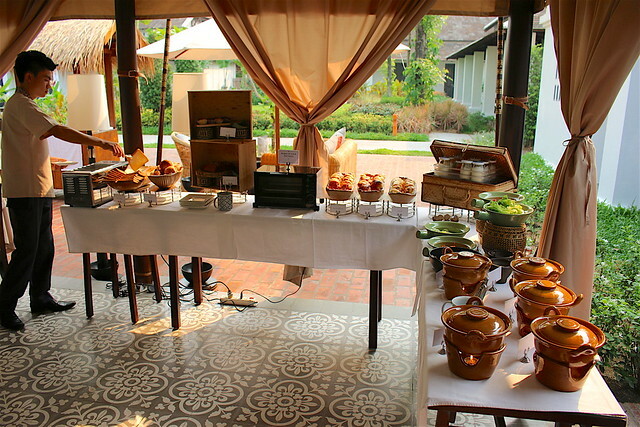 Here you have pastries, breads, juices, salad, yoghurt, and the sides for the egg station. Fruits, cereals and milk are at another table. 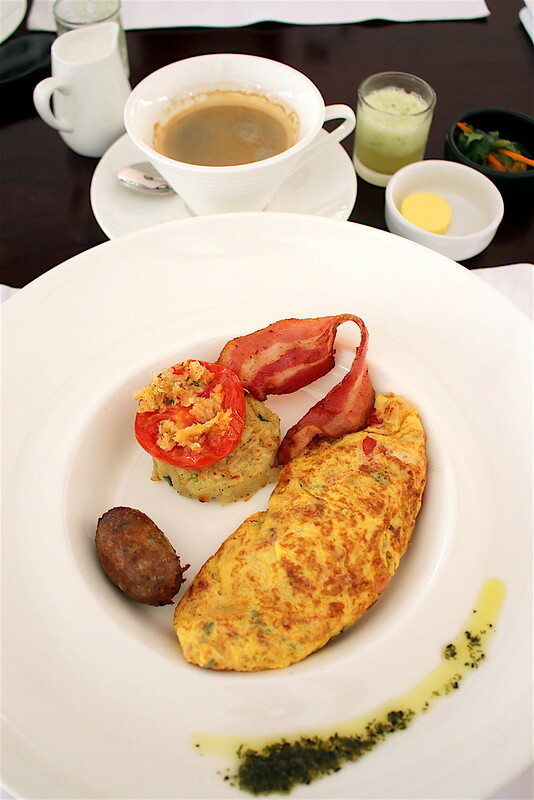 Breakfast platter - my live station omelette with bacon, sausage, tomato and hash brown - plus coffee and healthy juice drink. 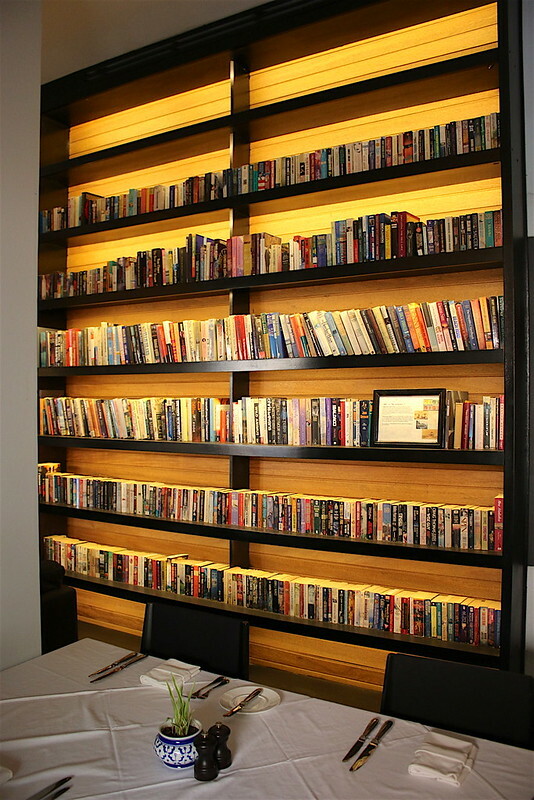 There is a huge library in the bar/indoor dining section - floor to ceiling shelves lining two walls facing each other running almost the entire length of the building. It is always comforting to see so many books. 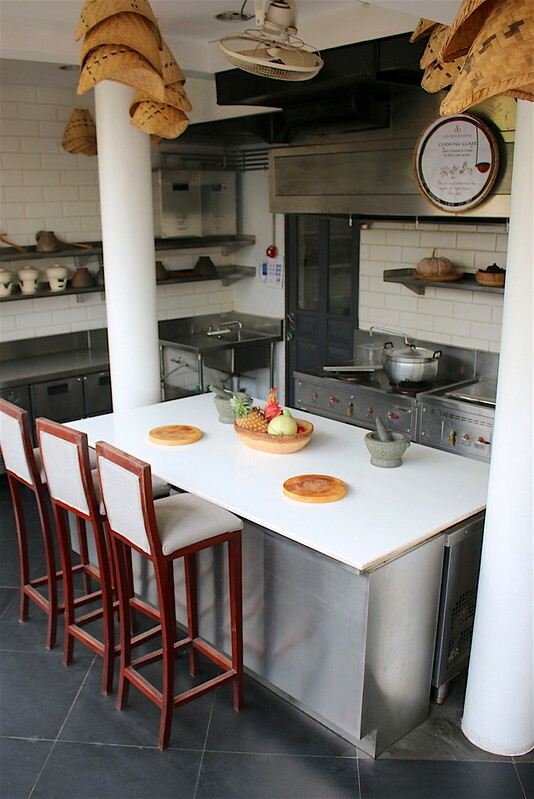 Take a look at the classes here at the Ka-Toke Cooking School (they have such a nice kitchen). Learn how to make dishes like Naem Dip (fresh spring rolls), Mhok Het (steamed mushrooms in banana leaf), Phanaeng Kai (chicken curry) and Num Wan Mak Mai (tapioca in coconut milk). 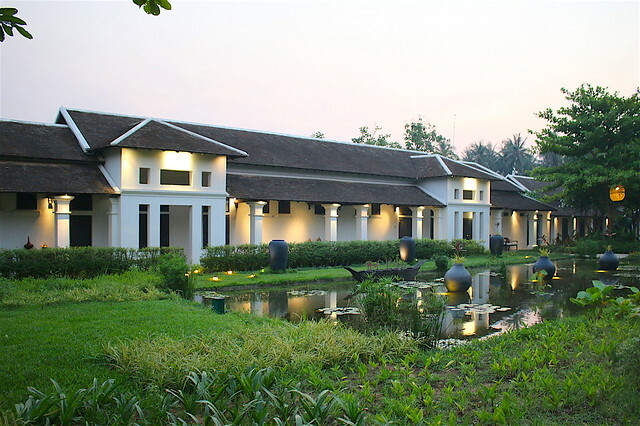 The massage therapists and beauticians at Le Spa offer treatments combining ancient Lao rituals and modern techniques. There is also a fully-equipped gym that's open 24 hours a day. There are also meeting room facilities. 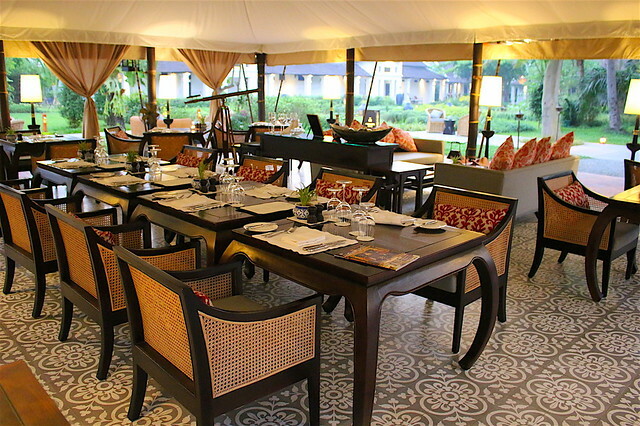 The boardroom and lounge, Kaipen, accommodates up to 70 people. 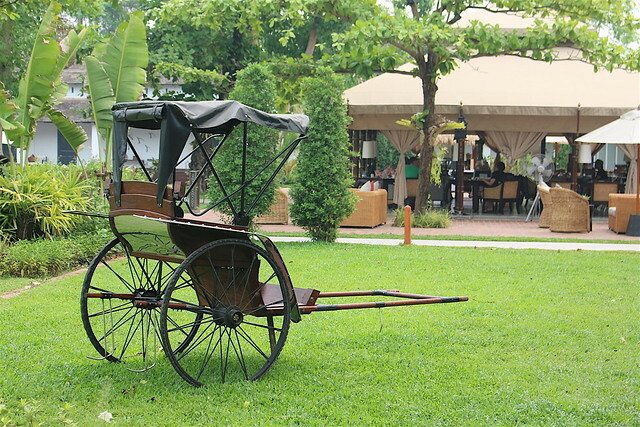 For larger events and family celebrations, the Garden hosts around 200 people. Staff are always warm and friendly. The GM Pablo Barruti is one of the nicest and most down-to-earth I have ever encountered. You will have a fabulous time here. When I come back, I will stay more than just two nights, so I can slowly savour all that Luang Prabang has to offer and be truly refreshed. 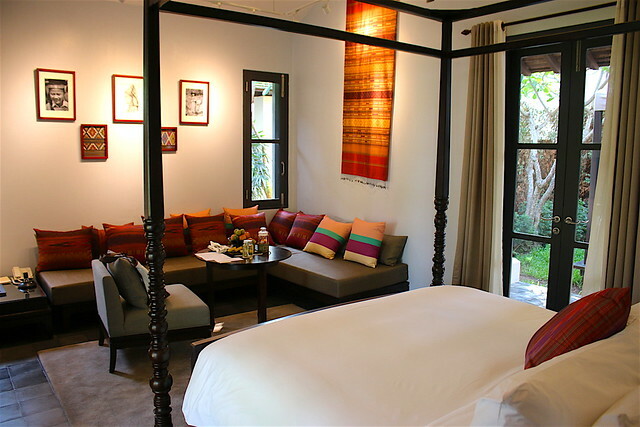 Take a look also at the 3 Nagas Luang Prabang, a sister property right in town that's also a UNESCO protected site featuring three historical houses.